Latest Official Oxygen OS 3.1.0 for Oneplus 2 is now available for download. OnePlus team releases this new 3.1.0 OS with lots of bug fixes like notification issues, improved Doze Mode functionality, added media sound toggle and some other General bug fixes. The new firmware is based on the Android 6.0.1 Marshmallow and not the latest Android 7.0 Nougat. And most of the Oneplus 2 users are waiting for the Android 7 nougat, but this will take some because the company will first release Android 7 for the OnePlus 3 and then move on to the OnePlus 2. This rollout will be incremental. And very soon Oneplus 2 users will see the system updates notification on their phone. To check the OTA update go to phone settings > About phone > System updates. If you can’t see any update, then wait for few more hours or a day. You will get this Latest Oxygen OS 3.1.0 update on your OnePlus 2. This is not much of a big update as compared to the previous Oxygen OS 3.0.2 and still lacks the VoLte support, which most of the user waiting for. If you are rooted users, then you will not get this update, and you can flash the same manually on your phone. Here is the guide which you use on your phone and update yours with this new update. The guide has two methods. First one for the Oneplus 2 user with non-rooted, stock recovery phone and the second one is for rooted users with TWRP recovery. 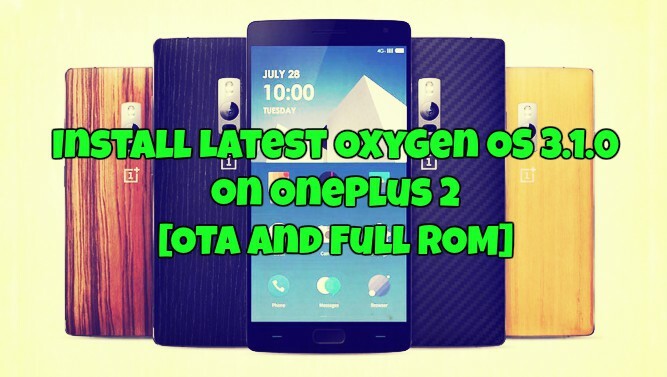 So what are waiting for, go to the download section below and download the latest Oxygen OS 3.1.0 OTA and full firmware files for OnePlus 2. OTA update link for the non-rooted users with Stock Recovery. Make sue you are running on Oxygen OS 3.0.2 to apply this 3.1.0 update on your phone. If you are not on the Oxygen OS 3.0.2, then download the FULL ROM Zip file and flash the same on your phone. Full Firmware File (Signed flashable zip file) This is the full ROM Zip file which works on the on the Rooted phone with TWRP recovery. Non- rooted users with Stock recovery aloos use this ROM to install the latest version of the Oxygen OS. The following tutorial will help you flash the latest Oxygen OS 3.1.0+ onto your rooted as well as non-rooted OnePlus 2 device. Read all the steps carefully and follow them step by step on your phone. 1. Only grab the OTA zip from the above mention link and save the file on your phone. 2. Boot your phone in stock recovery. To do this Switch off your OnePlus 2 and then just hold Volume down button, and then press the power button once. 3. Now hit “Apply updates from storage”. Select the OTA zip file and proceed with the installation. 4. Once the zip file is flashed. Restart phone. 1. Download the Full ROM zip file from the above mention links and save the same on your phone. 3. Once your phone in recovery Mode. Go to Wipe > Advanced Wipe and Wipe Cache, Dalvik Cache and Data. 4. Now go to the home screen again and tap Install option. Navigate to the Full Rom zip file location on your device’s internal storage and select it. Swipe to confirm. 5. Once complete Reboot System, First boot will take some. Now if you want to root your Oneplus 2 phone, then follow this method. Follow and like us on social media. For queries comment down below. Are you sure it’s DATA?? Isn’t it system??? With data you delete images, apps,…??? No? No data will remove only your apps, not the images and other saved files. Internal card or memory will removed all your files. I used the ‘Rooted’ method. This worked great for me. Thanks! This method will unroot your phone and update, so I decided to leave my phone unrooted after since I was only using root permissions for Flux. Saves another headache when I update next time.